With civil rights and anti-establishment sentiments in the air, there were numbers of white kids searching outside the popular top-10 musical box. Of course they’d already heard Brits Eric Burdon, Jimmy Page, Eric Clapton, and John Mayall’s interpretations of American Blues, but eventually and not surprisingly, those same white kids “discovered” what had been in front of them all along: true Blues. A group of University of Michigan students led by Fishel decided to hold a Blues festival. The group asked their school for sponsorship and two university-connected nonprofit entities – the University Activities Center (UAC), and Canterbury House, the student Episcopalian organization – put up $70,000 for the event. That spring the group visited Chicago to test the waters: what true blues performers attracted the best crowds? Luther Allison was one they found. They invited Allison to play at a free show in April and the reception was great. The group knew they could continue. As a Woodstock alum, it is hard to criticize what so many think of as the greatest festival of all time. History and commercialism have ways of distorting reality when reality is mostly a subjective, not a single unequivocal experience. Woodstock, for all its outstanding and now-historic performers and performances, lacked true blues. Ten Years After, Paul Butterfield, Canned Heat, and Blood Sweat and Tears all provided their interpretation of original Blues. 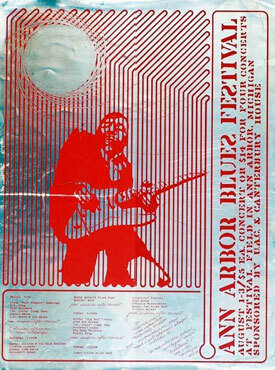 In 1970 a second blues festival was held, but success led to disruption and disruption led to financial loss. Also, the Goose Lake festival held the same time had a big-name line up that pulled possible guests away from Ann Arbor. The festival went away for two years, returned in 1972 to a three-year run, and then went away again. In 2016, James Partridge realized that in three years it would be the original festival’s 50th anniversary. In 2017 he organized a new Ann Arbor Blues Festival.